There are about a kazillion ants in the world! There are over 40 species just in Hawaii. There are ants in all kinds of habitats; some are scavengers, some are carnivorous (eat other animals), some eat only plants, and some are omnivorous (eat just about anything). The ones in your kitchen may be looking for sugar, for fats, or for meat. Or maybe just water. Most ants have well-developed jaws and can bite when disturbed. Ants live in colonies, which may include as few as a dozen or many thousands of members. You may see ants following one another in trails. Ants can leave a chemical signal on most surfaces that other ants can follow by chemoreception (smelling), using the tiny hairs on their heads and feet. 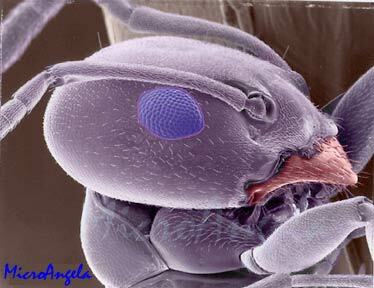 This ant head is a little less than a half millimeter long.